Five hundred pounds would have been a very large sum. We have not been able to decipher the message so will give a small prize, definitely not £500, to the first person to tell us the answer. 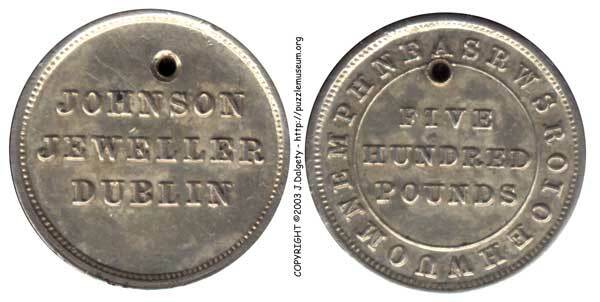 Johnson of Dublin also made this larger (27mm diameter x 2.5 mm thick) medal for the Irish Village at the Columbian Exposition in 1893. "Irish Village" photos courtesy of the Crowbirds.